Miss Addams a Loyal Progressive. 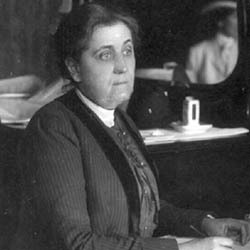 At a meeting of Illinois Progressives, on Tuesday, Miss Jane Addams [criticized] President Wilson for his attitude toward the delegation from the National Suffrage Association when he indicated that he felt himself responsible to his party rather than to the whole people and could take no action not dictated by that party. 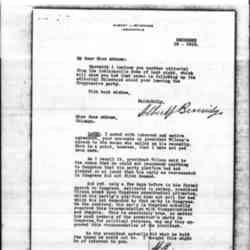 The attitude was commented on by The Star at the time as an amazing view for a President to take. Whether he approved or did not approve of woman suffrage was immaterial; the point was the narrowness of his conception of official duty. 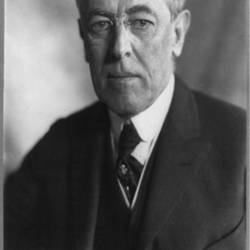 No man who has reached his high office has been more loudly heralded than Mr. Wilson as one of broad mind, but none of his predecessors has ever expressed such a limited view of his responsibilities. Had he done so, condemnation would have been loud and long from all quarters. Thick-and-thin supporters of the administration have, however, preserved a deep silence on the subject since he enunciated his remarkable opinion. 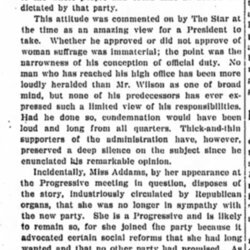 Incidentally, Miss Addams, by her appearance at the Progressive meeting in question, disposes of the story, industriously circulated by Republican organs, that she was no longer in sympathy with the new party. She is a Progressive and is likely to remain so, for she joined the party because it advocated certain social reforms that she had long wanted and that no other party had promised. As no other party has yet offered them, no reason exists for any change of attitude on her part or that of any other sincere Progressive. Rumors of a return of Progressives to Republican ranks are to be regarded with much skepticism. The circulation of such tales is a part of a G. O. P. program supposedly by its originators to be very subtle. 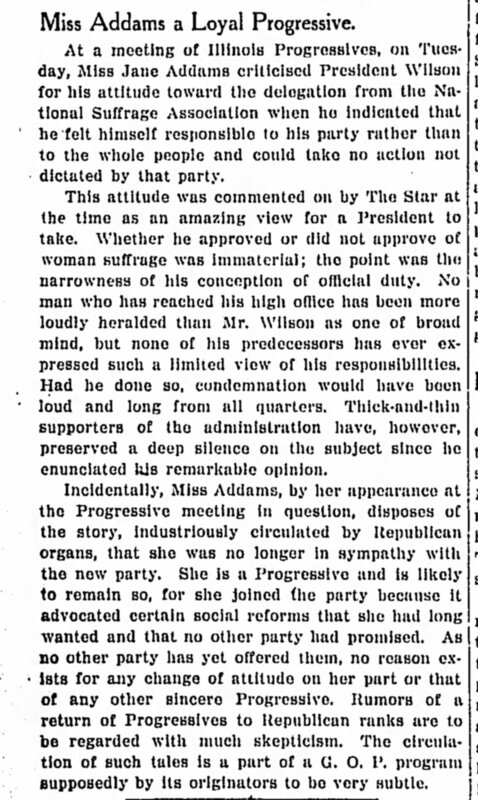 A news account of Addams' criticism of President Wilson on woman suffrage and affirmation of her membership in the Progressive Party. 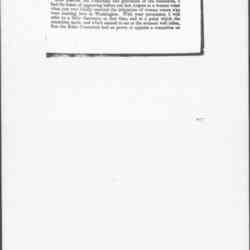 Miss Addams a Loyal Progressive, Indianapolis Star, December 18, 1913, p. 8. 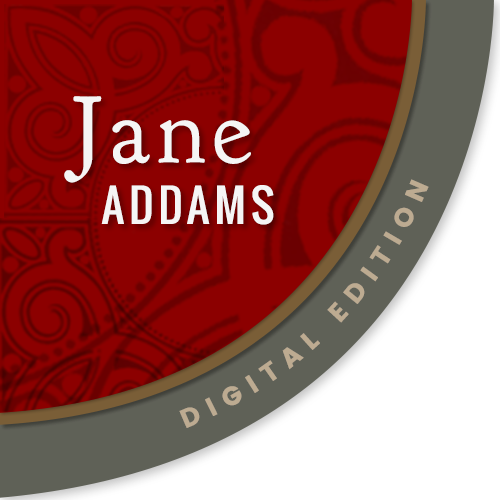 Addams, Jane, “Statements on Wilson Administration, December 16, 1913,” Jane Addams Digital Edition, accessed April 25, 2019, https://digital.janeaddams.ramapo.edu/items/show/13566.